Are your supporting your horses hoof properly when you tighten and loosen calks? The addition of calks on your horse’s hoofs while in the grass or on wet footing is a great way to add some traction and prevent your horse from slipping when you ride. However, one of my pet peeves is seeing someone cranking on a wrench to put calks in or take them out of a horses shoe without supporting the hoof capsule. Overly tightening them with a wrench means that, in turn, you’ll really have to crank hard to get them out after you ride. When holding a horses leg, it’s easy to feel how flexible and mobile the hoof is. Which makes me nervous when I watch horses hooves getting cranked on by a wrench when someone is adjusting calks. So be careful! Support the hoof capsule with your leg and hands, and don’t just haul on the wrench with the hoof resting on your knee, as this overly torques the horse’s foot. Instead support the hoof and then gently tighten the calk. 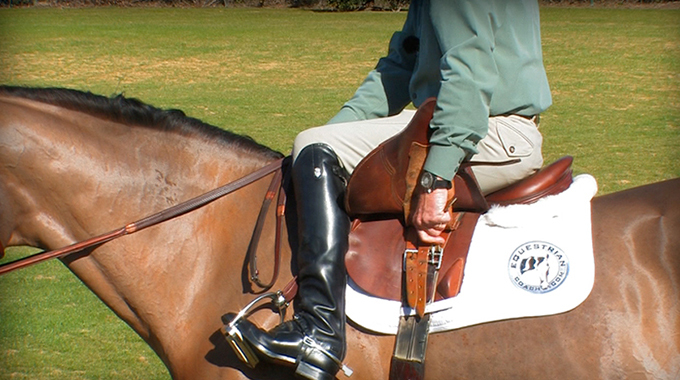 In this video, learn how to safely tighten your girth and shorten/lengthen your stirrup leathers while mounted on your horse without dropping the reins or stirrup irons and without the help of someone on the ground.